Our art guru shares how you can celebrate Cinco de Mayo this year with the Cincinnati Opera at the Cincinnati Art Museum! Keep reading for all the colorful details! Cincinnati Opera and the Cincinnati Art Museum have teamed up for Via la Frida May 5! Need plans for Cinco de Mayo? Look no further, because Cincinnati Opera and the Cincinnati Art Museum have teamed up for Viva la Frida! A Cinco de Mayo Fiesta. Read on to learn more about this festive event! Join the Cincinnati Art Museum Emerging Leaders Council and Cincinnati Opera Center Stage in celebrating the life of Mexican artist Frida Kahlo. With a festive evening of Mexican cuisine from Mazunte, music and dancing on Cinco de Mayo (Friday, May 5) from 6–9 p.m. at the Cincinnati Art Museum, Viva la Frida is going to be a fiesta! The Cincinnati Art Museum is welcoming three new curators. Our art guru sat down with each to learn more about them and their big plans for the future. Ainsley Cameron, Curator of South Asian Art, Islamic Art and Antiquities at the Cincinnati Art Museum. Cameron’s exhibition and catalogue project at the Philadelphia Museum of Art (PMA), Drawn from Courtly India: The Conley Harris and Howard Truelove Collection, provided an in-depth foray into the drawing practice at the courts of north India. She was also the curator-in-charge of digital initiatives in the reinstallation and reinterpretation of the PMA’s South Asian art galleries, which opened in October 2016. Previous curatorial appointments included roles at the British Library, the British Museum, and the Victoria & Albert Museum, making Cameron familiar with a wide range of South Asia’s artistic production, especially from the 16th century onwards. Cameron completed her doctorate at the University of Oxford in 2010. She also holds an MA from the School of Oriental and African Studies at the University of London, and a BA in Archaeology and History from the University of Toronto. “This is an opportunity to redefine CAM’s engagement with these collections on a regional, national and international scale, a process I am excited to participate in. I look forward to working with my new colleagues to explore the intricacies of the collection, the institution and this beautiful city,” Cameron said. She begins in Cincinnati in early May. Peter Bell, Associate Curator of European Paintings, Sculpture, and Drawings at the Cincinnati Art Museum. As Associate Curator of European Paintings, Sculpture and Drawings at the Cincinnati Art Museum, Peter Bell will be responsible for the stewardship and development of the museum’s extensive holdings of European paintings, sculpture and all works on paper excluding prints and photographs. In this role he will lecture and write on art history, curate European art exhibitions and permanent collection galleries, and engage with the community through museum programs and by managing the museum’s Friends of European Paintings, Sculpture and Drawings group. Bell comes to Cincinnati from the Metropolitan Museum of Art where he is Assistant Curator in the department of European Sculpture and Decorative Arts. There he has been responsible for Italian and Spanish sculpture, ceramics and glass, and European medals. He has researched and presented these collections, augmented them through acquisition and collaborated on conservation projects. At the Met he co-curated the exhibitions Antonio Canova: The Seven Last Works (2014) and Tullio Lombardo’s Adam: A Masterpiece Restored (2015), and recently curated Renaissance Maiolica: Painted Pottery for Shelf and Table (2016–2017). He was lead curator for the design, construction and permanent installation of the Met’s Venetian Sculpture Gallery (2015). Bell is a fellow of the American Academy in Rome. He received his undergraduate degree from Oberlin College in Ohio and a master’s degree from the Courtauld Institute of Art, University of London. He is expected to complete his doctorate from the Institute of Fine Arts, New York University, this spring. “I am thrilled to join the Cincinnati Art Museum and contribute to its impressive record of scholarship, acquisitions and exhibitions. It is particularly exciting to come to this august institution at a time of new growth in exhibitions and programming, and expanding public access and visitor engagement. CAM boasts one of the great collections of European art in the Midwest, one that is known and admired across the world. I look forward to advocating for these paintings, sculptures and drawings—artworks that can be as vital and relevant for Cincinnati today as they were in Europe 500 years ago—and to deepening our understanding of the important traditions they represent.” Bell starts at the end of May. Nathaniel Stein, Associate Curator of Photography at the Cincinnati Art Museum. In his role at the Cincinnati Art Museum, Dr. Nathaniel Stein will be responsible for the stewardship, interpretation, and development of the museum’s extensive holdings of photographs. He will curate photography exhibitions, conduct and publish research on works of art in the museum’s permanent collection, engage the community with innovative programming, lead acquisitions and manage the museum’s Friends of Photography group. Stein holds a master’s degree and doctorate in the History of Art and Architecture from Brown University and a bachelor’s degree in the History of Art from Wesleyan University. Prior to his position at the Philadelphia Museum of Art, he held fellowships, lectured, performed curatorial roles, and taught the history of photography at institutions including the Yale Center for British Art, the Victoria & Albert Museum, the Philadelphia Photo Arts Center, and the Rhode Island School of Design. “I’m thrilled that my family has been invited to join the CAM family, and for the opportunity to get to know Cincinnati’s dynamic photography community,” said Stein. “The museum’s photography program already reflects a history of dedicated curators, collectors and supporters. We’re in a strong position now to continue to honor the core traditions of the medium while also thinking openly and creatively about how to engage with a wider world. I think we can seize the moment, and I’m looking forward to getting started.” He will join the museum in late April. There’s a new exhibition at the Cincinnati Art Museum that opens up a colorful new world. Read on for more. Tiffany Glass: Painting with Color and Light is now on display at the Cincinnati Art Museum. Trained as a painter, Louis C. Tiffany, son of Charles Tiffany and founder of Tiffany & Co., was attracted to glass as an artistic medium for its unique ability to capture and convey color, light, and texture. I met with Cincinnati Art Museum Curator of Decorative Arts Amy Dehan to learn more about the history behind this colorful new exhibition. Fascinated by the rich and varied tones and expressions in medieval 12th-and-13th-century leaded windows that relied solely on colored glass, and not the addition of stain or paint to create images, Louis C. Tiffany sought to create his own modern “paintings” with glass. In doing so, he resurrected and revolutionized the art of leaded glass windows and later, with the introduction of the incandescent lightbulb, created magnificent lampshades—small, portable versions of his windows for the domestic interior. Tiffany’s achievements in the creation of leaded glass windows and lampshades were the combined result of his development and fabrication of an amazing variety of new types of glass and the careful selection and use of that glass to “paint” or convey an idea and image. Beginning in the mid-1870s, Tiffany initiated pioneering examples in glassmaking. Sheets of thick, milky, opalescent glass with folds, wrinkles and ripples were developed for the articulation of drapery and angel wings. Flat glass speckled with thin pieces of broken glass called “fract,” aptly called confetti or foliage glass, was created to portray trees or brush in the distance of a composition. Luster glass, a highly reflective, iridescent flat glass, was used to depict metallic surfaces, such as a knight’s armor. Often, multiple pieces of glass in different textures and colors were laid, or plated, over one another to create just the right effect. These new glass types and techniques were developed to avoid the use of paint and brush on glass, which, in Tiffany’s view, “produces an effect both dull and artificial.” Artists at Tiffany’s studio resorted to painting on the glass only when absolutely necessary—usually when depicting faces, hands and feet. The work’s primary composition and expressions relied solely on the material itself. It is important to note that Tiffany’s accomplishments were realized through the innovation, work and talent of many men and women working under his direction. Glass chemist Arthur Nash worked tirelessly, developing original formulas and processes to create the vast palette of colors and artistic effects in sheet glass that Tiffany desired. Agnes Northrop, lead female artist at Tiffany Studios, designed almost all the firm’s floral and landscape windows, earning international recognition through her work. And Clara Driscoll, a native of Tallmadge, Ohio, led the Women’s Glass Cutting Department, supervising a team of women charged with the key responsibility of selecting and cutting the glass for Tiffany’s windows, mosaics and lampshades. Driscoll, too, received national attention for her designs. Tiffany Glass: Painting with Color and Light is drawn from the Neustadt Collection, formed by visionary collectors Dr. Egon and Mrs. Hildegard Neustadt. Austrian immigrants, the Neustadts bought their first Tiffany lamp in the 1930s at an antique shop for $12.50. Deemed out of fashion at the time, the lamp fascinated the Neustadts and ignited their lifelong passion for the art of Louis C. Tiffany and Tiffany Studios. The Neustadts amassed an incredible collection of leaded glass windows, lampshades and bronze desk sets. In 1967, they acquired the vast inventory of opalescent sheet glass and glass “jewels” that remained at the Tiffany Studios when it closed in the late 1930s. This collection has played a critical role in scholarship surrounding the revolutionary materials, methods and techniques employed by Tiffany and his team. Exciting changes are in store as the art museum ramps up visitor experience through an innovative gallery redesign. Read on as our art guru gives us a sneak peek inside. Anyone who’s visited the Cincinnati Art Museum has likely traveled through the Schmidlapp Gallery, the art-filled walkway that connects the lobby to the museum’s Great Hall. Thanks to a generous $1 million grant from Jacob G. Schmidlapp Trusts, Fifth Third Bank, Trustee, along with additional financial support from the State of Ohio, an innovative redesign of this centralized gallery is currently underway. The renovations will allow the community to connect with art, engage in focused study of collections, and provide orientation and connection to the historic Bimel Courtyard. The design for the new Schmidlapp Gallery focuses on its position as a central architectural artery essential to every museum visit. The renovation will invite visitors to pause, converse, linger and discover highlights of the museum’s collection. The integral features of the plan include the addition of a courtyard wall of windows for natural light, seating to encourage congregation, individual looking lounges and detailed curatorial interpretation around singular artworks, and the installation of Saul Steinberg’s cherished large-scale “Mural of Cincinnati.” New floors, lighting and state-of-the-art temperature and humidity controls will be part of this revitalization. 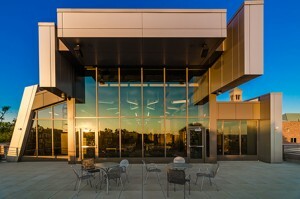 Cincinnati companies emersion DESIGN and Monarch Construction have been contracted for this project. The renovation will be completed by the end of 2017. Installation of artworks, interactive technologies, and other features will be added in early 2018. Although changes to the space will be significant, care is being taken to minimize visitor impact during the construction period. The Schmidlapp Gallery will be closed for one day, on Friday, March 3, to complete the final stages of removing the artwork from the gallery space. A selection of bronze sculptures will be temporarily relocated to the Great Hall. A temporary wall is being erected along the west side of the Schmidlapp Gallery and will remain in place until mid-June. During this time, the space will be open as a walkway and partial gallery. The space will remain ADA-compliant and allow room for wheelchair and stroller access. From mid-June through early September 2017, the museum plans to close the space and detour visitors through the Hanna Wing. The Schmidlapp Gallery is one of the most used spaces within the museum. The Schmidlapp Gallery has recently been used to feature “icons” drawn from the museum’s permanent collection including Warhol, Monet and Degas. Prior to October 2011, it showcased the museum’s Antiquities collection. The Cincinnati Art Museum first opened its doors to the public in 1886, making it one of the oldest art museum buildings in the country. The Emma Louise Schmidlapp Wing, which includes the Schmidlapp Gallery, opened in 1907. It was designed by Chicago architect Daniel H. Burnham in the Doric temple style. The museum has experienced numerous expansions and renovations since its original construction. Many aspects of the most recent Cincinnati Wing and Make Room for Art renovation projects successfully drew on the same architectural principles to be used in the Schmidlapp Gallery renovation, putting visitor experience, inspiration and orientation at the center of the project. The museum’s Great Hall was renovated in 1993 and the main lobby in 2014. The renovations in the Schmidlapp Gallery will connect these spaces and create more opportunities for learning, exhibition, congregation, conversation and comfort. Join the Cincinnati Art Museum at the must-attend event of the summer featuring wine tastings, delectable local food, live music, and a silent auction - all while supporting a charitable cause. The Art of Wine will be held Friday, June 16 at the Cincinnati Art Museum. It’s a summer favorite with a new twist! Cincinnati Art Museum’s 27th annual food and wine event is now A Taste of Duveneck presents: The Art of Wine sponsored by Dewey’s Pizza, on Friday, June 16, 6-9 p.m. The new name draws attention to the event’s wine-focus with samples available for tasting and fine wine for sale at the silent auction, along with other popular items. Also new, guests can experience exclusive access to the entire museum, including special exhibitions. In addition to an extensive assortment of premium and sparkling wine, The Art of Wine also includes a variety of craft beer, Cincinnati’s best gourmet food and live music by the Naked Karate Girls. The event will feature bites from dozens of vendors including the BonBonerie, Eli’s Barbeque, Palomino, Eddie Merlot’s Steakhouse, Quan Hapa and many more in the Great Hall and outdoors in the Alice Bimel Courtyard. Dance the night away as local cover band the Naked Karate Girls plays all of your favorites. This event-of-the-summer is one you truly won’t want to miss! This year, all proceeds from The Art of Wine will help fund one of the museum’s premier family programs, Family First Saturday. Family First Saturday takes place the first Saturday of each month and features family entertainment, gallery scavenger hunts and art-making activities for kids of all ages. It is one of the most important visual art programs in the city and serves thousands of families. In its first 26 years, the event has raised millions of dollars for the Cincinnati Art Museum. Early bird tickets are $55 per person and are available in limited quantities through April 16, 2017. General admission tickets are $85 per person. Donor opportunities are available. For more information, please contact events@cincyart.org or (513) 639-2962. Cincinnati Art Museum’s Curator of Prints Kristin Spangenberg, shares what makes the new exhibition that accompanies Dressed to Kill so special. Transcending Reality: The Woodcuts of Kōsaka Gajin is a new exhibition at the Cincinnati Art Museum. Transcending Reality: The Woodcuts of Kōsaka Gajin is the first major exhibition of the artist’s work in the United States. The Cincinnati Art Museum’s Howard and Caroline Porter Collection is the largest repository of Gajin woodcuts outside Japan. Gajin was a student of Japanese and Western-style painting and an art educator with enthusiasm for the intuitive work of children. The artist wanted his work to “transcend reality.” He lovingly recorded the beauty of Japan’s landscape and architectural monuments in a way that is modern in its individualized expression, not unlike the era’s “action painting” in the West. Among Gajin’s favorite subjects, explored in great variation, were Mount Fuji, temples and trees such as The Great Japanese Cedar. With minimal lines, he created bold forms that were printed on un-sized paper. Featured alongside Transcending Reality is Dressed to Kill: Japanese Arms and Armor, an in-depth look at Japanese Samurai culture and arts from the 16th–19th centuries. Joint tickets allow entry to both special exhibitions. All ticketed exhibitions are free for museum members. Non-members may purchase tickets at cincinnatiartmuseum.org/transcendingreality or at the art museum. $10 ticket for adults; $5 for children ages 6–17 and college students with ID. Other discounts available. Cincinnati Art Museum’s Curator of Asian Art Hou-mei Sung, Ph.D., takes visitors inside Japanese samurai culture and arts in the new exhibition Dressed to Kill: Japanese Arms and Armor. Dressed to Kill:Japanese Arms and Armor is a new exhibition at the Cincinnati Art Museum. With 11 full suits of Japanese armor and a wide variety of arms from both the Cincinnati Art Museum’s collection and the private local collection of Gary Grose, the exhibition is one of the most exciting assemblies of Samurai suits and related materials ever shown. The weapons on view include swords, polearms, guns, pistols, and hidden weapons. The exhibition will also showcase related Japanese artworks from the museum’s permanent collection, including battle prints, paintings, metal crafts, banners, and costumes, most of which have never been on display before. The Japanese word “Samurai” describes the middle and upper echelons of the warrior class in Japan from 1185 to 1868. These warriors were trained as officers in military tactics and strategy, and they followed a set of rules and ethical principles that later came to be known as the bushidō (the way of the warrior). Not only were the Samurai warriors the ruling power, their code of behavior, based on the principles of loyalty and honor, continues to play a significant role in Japanese aesthetics and culture today. Among the eight suits of armor from Gary Grose’s collection is an example made for a boy about 13 years old. Armor constructed for boys’ coming of age are rare and were crafted with the same degree of precision as adult armor. Often the children of Samurai were forbidden from participating in battle. Some, however, were required to partake in battle from a young age to gain experience and earn loyalty and respect. The beautifully stenciled doeskin, the gilded iron helmet, and the careful construction indicate this small-scale armor was made for a wealthy Samurai family. The helmet is shaped like an eboshi, a type of headdress worn at the imperial court during the Heian period (794–1185). All three suits of armor in the museum’s collection tell interesting tales of women who helped build the Japanese art collection in the late nineteenth century. Although the museum’s suits are among the earliest artworks in its collection, two have not been on display for more than a century. The first entered the collection in 1881, five years before the institution opened its doors to the public. It was gifted by Mrs. Enoch T. Carson through the Women’s Art Museum Association of Cincinnati (WAMA), an organization instrumental in founding the museum. The other two suits of armor, purchased from Dr. Adeline Kelsey (1844–1931) in 1892, tell a touching tale about a courageous female doctor who served in Japan as a medical missionary. She raised funds to assist two young Japanese women obtain medical training in Cincinnati, who then became pioneering female doctors in their home country. Featured alongside Dressed to Kill is Transcending Reality: The Woodcuts of Kōsaka Gajin. Joint tickets allow entry to both special exhibitions. All ticketed exhibitions are free for museum members. Non-members may purchase tickets at cincinnatiartmuseum.org/dressedtokill or at the art museum. $10 ticket for adults; $5 for children ages 6–17 and college students with ID. Other discounts available. Read on as our new art columnist shares about a serene experience in the new, free photography exhibition at the Cincinnati Art Museum. The Cincinnati Art Museum’s The Poetry of Place: William Clift, Linda Connor, and Michael Kenna, is a unique photography special feature on view now through June 11, 2017. Featuring landscape and interior scenes, The Poetry of Place showcases 18 black-and-white photographs. The artworks, all from the museum’s permanent collection, hint at the themes of memory and time, uniting images of an ethereal, serene world. Current discussion of Clift’s work centers on his soulful photographs of the monumental landscapes of Shiprock, New Mexico and Mont St. Michel in Normandy, France. The Poetry of Place also includes photographs Clift took for a U.S. bicentennial celebration project depicting county courthouses across the country. Since 1967 Connor has explored the poetry and mystery of sacred sites. On the occasion of the 2006 exhibition Andrew Wyeth Watercolors and Drawings: Selections from the Marunuma Art Park, Japan, the Cincinnati Art Museum invited Connor to capture the essence of the Olson House, a 200-year-old Maine farm house made famous by Wyeth’s paintings. Kenna invites the viewer to look at the world with different eyes. His images include minimalist views of the natural landscape as well as human-made structures, always with a quality that is both meditative and mysterious. The special feature title draws inspiration from Kenna’s comparison of his visual language to haiku poetry. Women Writing for (a) Change will host a two-part six-hour writing workshop at the Cincinnati Art Museum on April 29 and April 30, 2017, from 1 to 4 p.m. The workshop invites participants to take inspiration from photographs in the special feature. For more information, please visit www.womenwriting.org. The Poetry of Place is free and on view in Gallery 104. To learn more, please visit cincinnatiartmuseum.org/poetryofplace. Spring is on its way and with it comes wanderlust. Sadly, an emergency trip to Tahiti can get pricey, but what about some urban exploration closer to home? Our art expert shares some of the best kept secrets in Cincinnati. If you need a break, consider a trip to beautiful Eden Park where Mary R. Schiff Library is waiting just for you…and there is coffee! (Although, it doesn’t say “Drink Me” like in Alice’s Wonderland) The Mary R. Schiff Library, nestled within the walls of the Cincinnati Art Museum (CAM), has something for everyone and may possibly be one of the best kept secrets in Cincinnati. What sounds better than grabbing a cup of coffee and heading out onto the Library’s terrace to enjoy a gorgeous view of Downtown Cincinnati? How about a free Sunday afternoon film? Or free access to a unique and diverse book and magazine collection? We know you want to look at those vintage fashion magazines. Diving head first into the ‘rabbit hole’ of art? The Mary R. Schiff Library has programming designed to introduce you to art. In the past year, Lewandowicz has worked with Gary Gaffney, Art Academy of Cincinnati, to create an informal local artist discussion panel called “Dialogues with Artists” to cater to everyone, from art collectors to those who just want to learn more about art. Do you love film? Brian Sholis, Associate Curator of Photography, has also utilized the breathtaking Library space for his recurring film series; “Moving Images” . “The Cincinnati Art Museum used to collaborate to produce a film series and I wanted to recommit us to showing films,” said Sholis, “My series, “ ‘Moving Images’, offers a mix of films by and about photographers and artists; a secondary goal is to present films about art or art institutions. So set aside some time for YOU and you’ll soon be singing Alice’s song “In a World of My Own” as you get lost in the Library. Grab a coffee (or ‘move down’ for tea if that’s your thing), enjoy the warm weather, a beautiful view of Cincinnati and flip through a vintage copy of “Vogue” …or swing by for a Sunday afternoon film. The Mary R. Schiff Library is open Tuesday – Friday, 11 a.m. to 5 p.m. and the second Saturday of every month, Sept. through Jun. Plan your trip here. Featured speakers; Jill Rowinski, (Art Academy of Cincinnati graduate/regional arts advisory committees/grassroots arts organizations involvement), and Emil Robinson (Cincinnati artist/educator with international and national museum involvement). **The Library Archives are not open to the public due to their fragile state (onion paper and microfilm items require special love and care!) but the archives are available to researchers or academics by appointment. Please call (513) 639.2978 for more information. 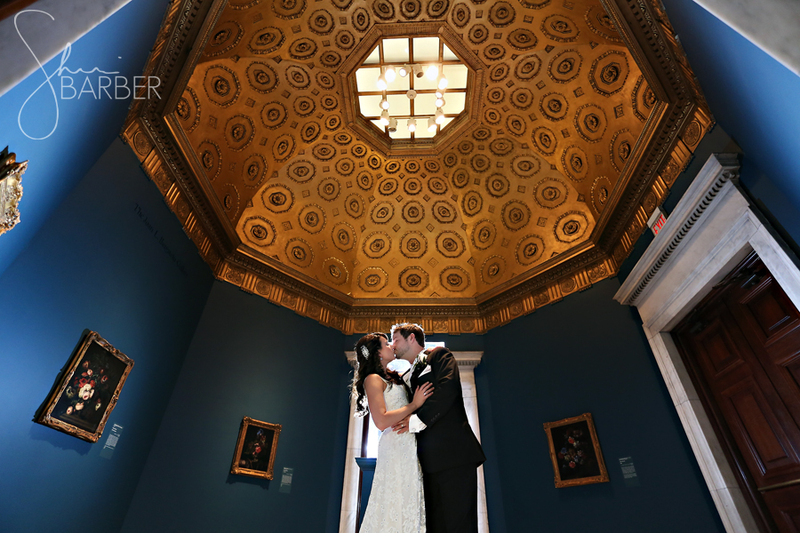 Our new art columnist shares a few of the latest wedding trends from the team at the Cincinnati Art Museum, a picture-perfect wedding venue. Although stressful at times, a wedding now has the freedom to be whatever the lucky couple wants it to be. The wedding planning trends seen 25 years ago (all aboard the ‘poofy sleeve’ train — choo choo!) have lost a little steam and the simplicity of “Pinterest” shows us that a “DIY wedding” can be just as beautiful as a traditional wedding in a grand church. Even on a strict budget, weddings can literally be anything you want them to be by simply pulling together that “series of small things” to create the perfect day you’ve always dreamed of. The only trick is pulling it all together. So what should you do first? Pick a venue and a date. The Cincinnati Art Museum (CAM) has been around for nearly 130 years and could be considered a ‘seasoned veteran’ of the wedding venue world in Cincinnati. 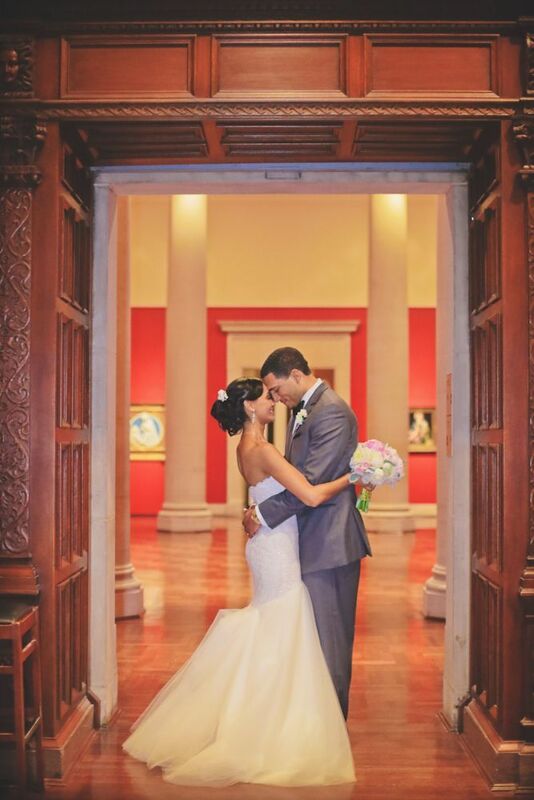 From gorgeous Summer weddings in the CAM Courtyard to the rich colors of Fall weddings in our Great Hall, the Art Museum hosts an average of 35-45 weddings a year and some pretty amazing, jaw-dropping photo opportunities for those tying the knot. Or perhaps you need to pin down the details for florists, photographers, event planners or…OH! The cake! Not to worry, CAM has a full network of wonderful vendors and rental equipment providers. 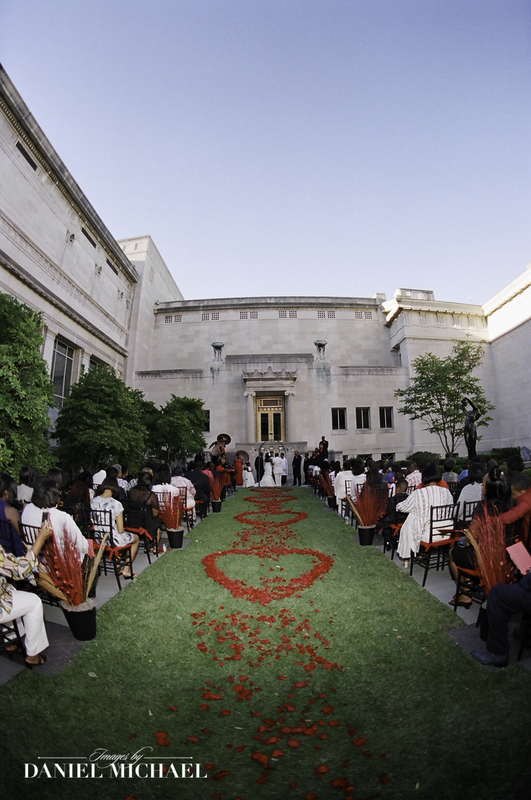 For more information on tying the knot at the Cincinnati Art Museum, please visit our website or email special.events@cincyart.org.